One month til the end of summer, and we finally have a glorious weekend. And I mean glorious. It was sunny and warm, but not humid. It was so much fun… just relaxing in the sun and getting nice and tan, with my friends Jeremy, Rafael and Ricardo around me. We even met two new (and very cute) new boys who we are hoping become part of our growing circle of friends. That’s what happens when you spend both days of a weekend at Chicago’s infamous Hollywood Beach. That’s right… the gay beach. 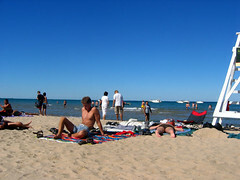 Its official name is actually the Kathy Osterman Beach, but it’s more commonly known as Hollywood Beach for two reasons– one, because that is the actual former name of the beach (it used to be two separate beaches, Hollywood and Ardmore), and two, because Hollywood Avenue, which is the final turnoff from Lake Shore Drive on the north side, runs right alongside it. Oh sure, you could surmise that it is also so named because of all the preening and prancing of the queens along the sands… but that’s merely coincidental. Its present name, however –Kathy Osterman Beach– is also very fitting. She held such prestigious positions as Edgewater Community Council (1985-1986), 48th Ward Alderman (1987-1989) and Director of the Mayor’s Office of Special Events (1987-1992). During that time, she was an outspoken and passionate voice for minorities, the poor, the aged, the LGBT community, and community pride in general. Her outspoken style and optimistic outlook influenced many significant events in the history of Chicago, and changed the lives and the well-being of millions of people. Ä¢ Created “Operation Lakewatch,” where she herself recruited local boaters and fisherman to basically watch the lake for the city by collecting water samples and report illegal dumping. Ä¢ Served on City Council committes on: Aging and Disabled people; Capital Development; Economic Development; Education; Energy; Environmental Protection and Public Utilities; Consumer Protection; Beautification and Recreation; and Human Rights. Ä¢ Responsible for all of the city’s music and neighborhood festivals. Ä¢ Operated Taste of Chicago, the city’s largest festival, and the second-largest tourist attraction in all of Illinois. An ebullient, optimistic, dynamic individual, Osterman was a fierce and outspoken lobbyist for the passage of Chicago’s Human Rights Ordinance. She worked closely with gay and lesbian activists, helping formulate logistics. She personally introduced many of the key players to each other, and is also credited for developing the imaginative “bring in the nuns” strategy, calling on women of the cloth to lobby the large Roman Catholic bloc of aldermen within the City Council. The Human Rights Ordinance was passed in 1988, and Osterman considered this to be one of her greatest accomplishments in public life. Thereafter, she used her office to assist gays and lesbians whenever possible. And, Osterman often represented Mayor Daley at fundraising events and other activities within our community. 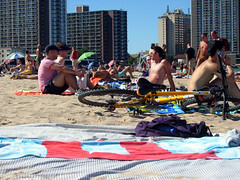 So it’s fitting that Chicago’s gay community has adopted the south corner of the Kathy Osterman beach as its own. It’s a far hike from Boystown, and even a bit of a trek from my neighborhood of Andersonville, but it’s well worth it. The beach is lovely and clean, and huge. And the boys… well… the boys are plentiful. We may still call it “Hollywood,” but there’s no denying that its present namesake is just as deserving of that moniker. The two names go hand-in-hand quite well. It’s just another wonderful treasure that’s a part of this wonderful city I live in. And I’m proud of that.